It’s been a good day for Y Combinator. Hot on the heels of news that YC portfolio company Wufoo landed a $35 million exit, YC alum TalkBin has just announced that it’s been acquired by Google — less than five months after the company was founded. 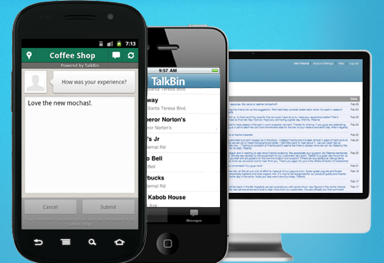 TalkBin offers a platform that lets customers give immediate feedback to local businesses (users submit their opinions and critiques via mobile applications, and it looks like the businesses can read and respond to them from a web app). TalkBin’s homepage shows screenshots of both Android and iOS applications, but I can’t find them on either marketplace (I’m not sure if the apps were pulled or if they simply haven’t been released yet). The mostly-stealthy Montain View-based company was founded in December 2010 by Qasar Younis, Michael Ma, and Sunny Dhillon. Given how new the service is it seems that Google is after the team, but it also apparently sees potential in the product too — Google will be shutting down TalkBin temporarily, but it plans to reopen the service to new businesses down the line. We are excited to announce that we’ve been acquired by Google! When we started building TalkBin in 2010, we set out to find a better way for consumers to connect with their local businesses in a more personal way. While we’re proud of what we’ve accomplished, we believe Google’s awesome mobile and local teams combined with their consumer reach will help us make our bigger goals a reality. We appreciate all the support and positive feedback we received from all of our partners and we’re elated to join Google and get started!